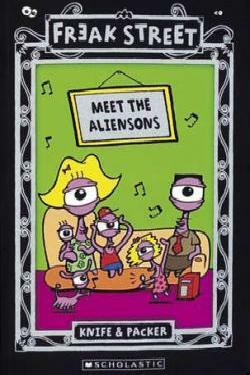 There are the Aliensons - just your average purple, one-eyed family from the planet Valvax-7. There are the Zombiesons. Slightly spooky, but forget terrorising graveyards and eating flesh, they prefer to eat takeaway in front of the TV. Let's not forget the Humansons - they're a little like you and me, only a lot more stupid! The Wizardsons have magic powers, a pet dragon and live in a giant mushroom! The Vampiresons are sharp-fanged vegetarians with a pet bat. And, finally, the Supersons all have mega-bizarro superhero powers and watch over Freak Street from their humungous skyscraper! Filled with Knife & Packer's trademark colourful illustrations and bizarre humour, 'Freak Street' will be a hit with fans of 'Captain Underpants' or Andy Griffiths.